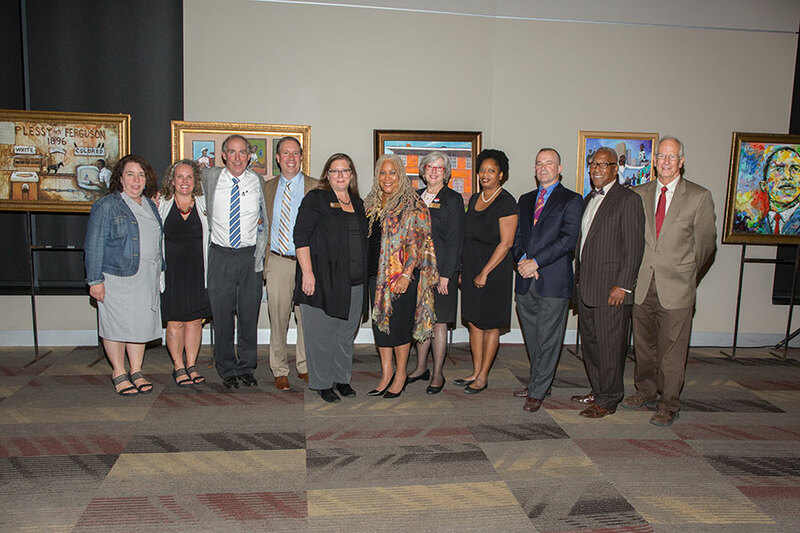 Florida State University administrators, faculty, staff, alumni and supporters gathered for a powerful evening of reflection and inspiration at the Dunlap Champions Club Thursday, Nov. 1. The event launched a new institute dedicated to the study of civil rights in America and the promotion of social change. 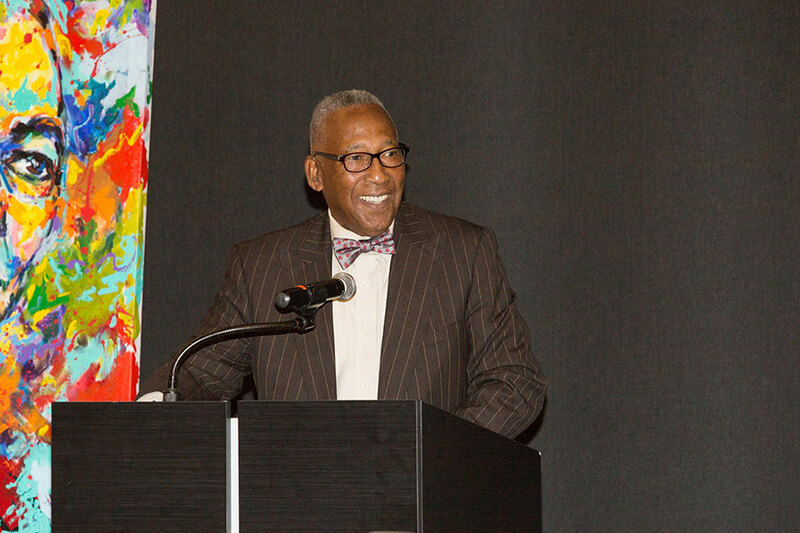 The new FSU Civil Rights Institute is the brainchild of Doby Flowers and attorney Fred Flowers, both FSU alumni. Doby Flowers was FSU’s first African-American Homecoming Queen, and her brother, Fred, was the first African-American student athlete to wear an FSU uniform. 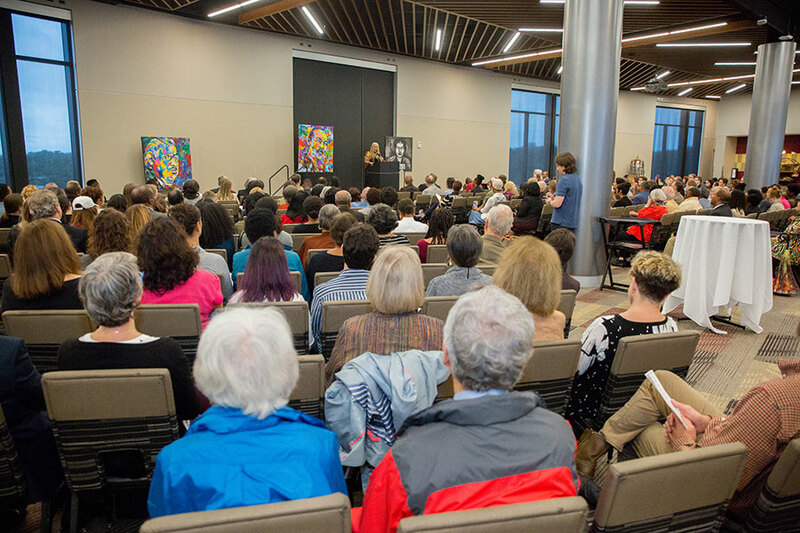 Doby Flowers presided over the event, recounting her experience integrating the university with her brother and others more than 50 years ago. “We struggled socially, but we had each other, and look what has happened here today,” she said. The institute is an interdisciplinary endeavor created by the Office of the Provost, FSU Libraries, the Center for the Advancement of Human Rights, the College of Social Sciences and Public Policy, the College of Communication and Information and the College of Criminology and Criminal Justice. Sally McRorie, provost and executive vice president for Academic Affairs, recognized the Flowers siblings and stressed the importance of the new institute. Gale Etschmaier, the new dean of FSU Libraries, thanked the Flowers for spearheading the project. “We thank you for your passion, inspiration and incredible work in establishing and proposing this institute,” Etschmaier said. 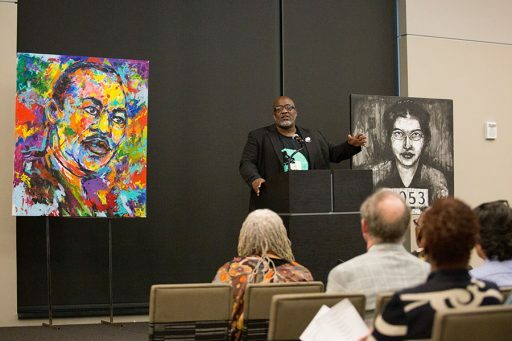 The institute, which creators say will continue to evolve, will host speakers and events, curate museum exhibits, develop an interactive website and publications, support education and research, and build library collections that focus on civil rights and social change. Davis Houck, the Fannie Lou Hamer Endowed Professor of Communication and institute steering committee member, thanked former FSU libraries dean Julia Zimmerman for her help in establishing the institute. Houck took event attendees through an imaginary tour of the institute’s collections that will be housed at Strozier Library. In the basement, Houck discovered articles that will be a part of the institute’s collection, including historic African American newspapers, the Tallahassee Civil Rights Oral History collection, microfilm editions of NAACP and ACLU organizational records and most notably Emmett Till archives, which Houck is largely responsible for curating over the last several years. Desmond Meade provided the keynote address for the evening. Meade is president of the Florida Rights Restoration Coalition and chair of Floridians for a Fair Democracy, the group that is responsible for the Amendment 4 ballot initiative. The amendment seeks to change Florida’s Constitution to allow felons who have completed their sentences to regain expeditiously the right to vote in Florida. 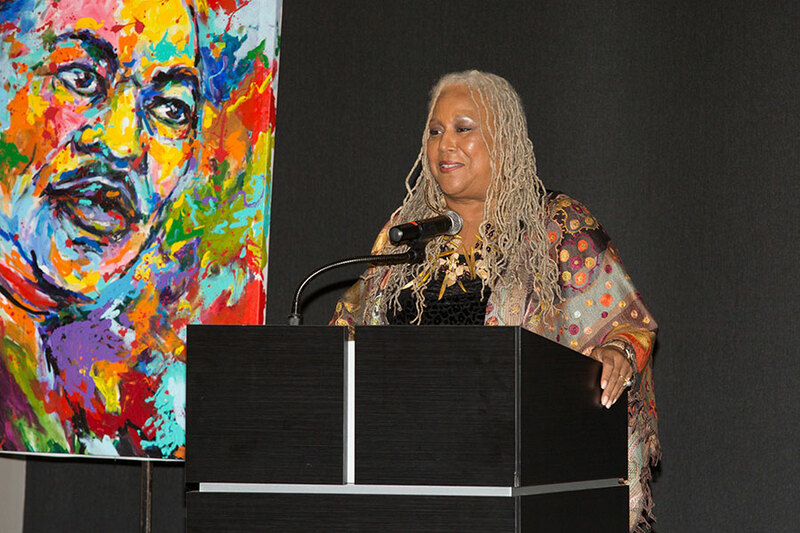 The event also featured work from Houston-based artist Ted Ellis, whose exhibition featuring portraits of civil rights giants, such as Rev. Dr. Martin Luther King, Jr. and Rosa Parks, has been showcased in the halls of Congress.The evening concluded with the announcement that institute partner, the Center for the Advancement of Human Rights, will host two summer fellowships for FSU undergraduate and graduate students to study civil rights and social justice efforts in the name of the institute. 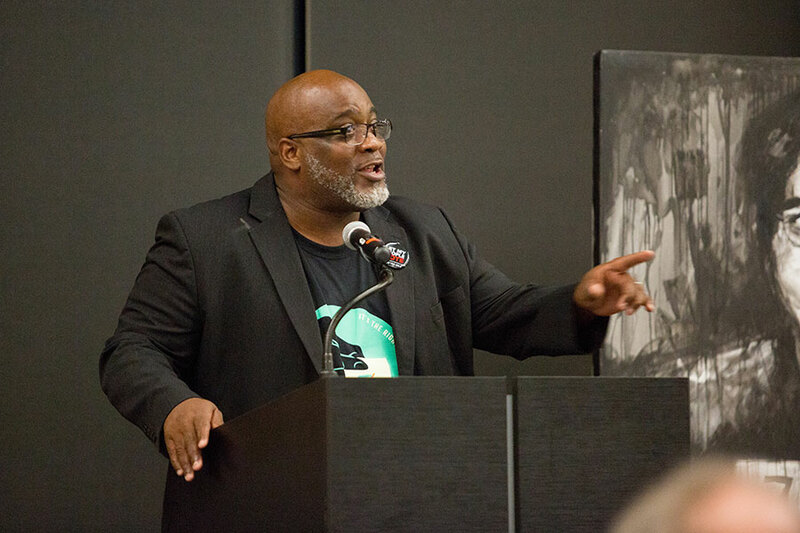 The institute’s next event will be a lecture and panel on hate speech at 5 p.m. Tuesday, Nov. 13, at Broad Auditorium, Pepper Center, 636 W. Call St.
Doby Flowers said the inaugural event aimed to give people an idea of what the institute will be about moving forward — art, historical collections and action. “Things can change, and things do change when people are change agents for that which is good,” she said.